Here are two boys you haven’t seen on the blog in quite a while — our blind Beagles, Austin on the left and Louie on the right. 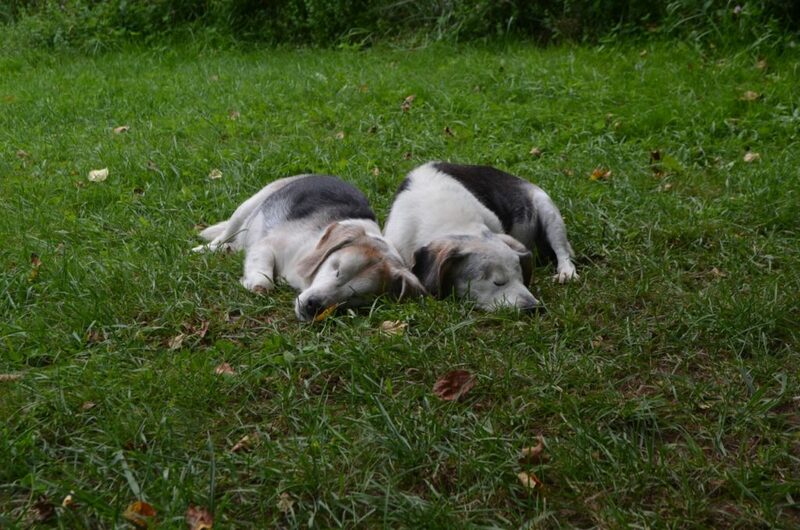 Alayne took that photo a few weeks ago when they were enjoying a late afternoon nap in the dog yard. Austin and Louie look almost like twins, have the same disability, and are the best of friends. Austin came to us as a blind puppy way back in 2008 from Atlanta Beagle Rescue. Louie arrived later, in 2011, also from Atlanta Beagle Rescue. Both boys had eyes when they came to us. Austin had been born blind with a retinal deficiency, but later developed glaucoma. Louie was blind from both progressive retinal atrophy (PRA) and cataracts when he arrived, but those two conditions later produced glaucoma as a secondary effect. We’ve often described eyes as a “house of cards,” because a single once-manageable disease can later cause secondary diseases — and ultimately the whole thing comes crashing down. The end result is painful, blind eyes. Sometimes an animal can have “just” PRA, or cataracts, for example, but frequently these conditions over time lead to other diseases. This is why diagnosing eye conditions can be difficult, because the symptoms can be complex and confusing, and multiple eye diseases can be occurring at the same time. In cases like this, it’s really important to see a veterinary ophthalmologist if at all possible. Because both Austin and Louie were blind already, and their eyes had become painful from glaucoma, we had their eyes removed to provide permanent pain relief. Last year Austin became a “double disability” when our veterinary surgeon in Burlington removed his left front leg due to a painful joint disease. Both Beagles are doing great, but they are sorry to see a long, beautiful summer coming to an end! Side by side, you can definitely see how much they look alike. It’s always good to have a friend to share a nap with. (pardon that grammar!) Pretty soon they’ll all be by the heat of the wood stove. For those of us still in the 60s and 70s, it’s such a relief from all the summer heat. Just wanted to ask how Aaron is doing and if he is still coming into the house at night. Or if he plans to now that it’s going to get cooler? He’s such a big beautiful dog. Barb, Aaron is doing great, and yes, he is still coming back to the house in the evening … then I take him out in the morning to the pasture for “guard duty.” Unlike the other dogs, he’s enjoying the arrival of cool weather! What sweeties! They look so contented together. It’s nice to see these guys again.